If you’re among the more than 500 College Station residents who’ve signed up to receive irrigation notices from Brazos Valley WaterSmart, you’ve seen the impact of the innovative program on your water bill. For those of us who keep an eye on our precious aquifers, the impact has been even more dramatic. The program’s goal is to improve residential outdoor water use and reduce landscape overwatering, and it’s succeeded beyond anyone’s expectations. When you consider our population has grown by about 30 percent since the 2010 Census, the results are downright astounding. The water budgets it generates and other interventions such as our irrigation checkups have reduced the number of high-volume single-family residential consumers in College Station by nearly 50 percent. Since the program’s inception in 2010, the cumulative reduction in water use in College Station is more than 630 million gallons of water. That’s about how much our community consumes in two full winter months. The program has even had a positive effect on the efficient use of your tax dollars, trimming the City of College Station’s electric bill by at least $110,000 a year because of reduced pumping, treatment, and electricity needed for distribution. It’s not surprising that others across the state have noticed our miracle on the Brazos. Last week, Brazos Valley WaterSmart received the prestigious Blue Legacy Award from the Texas Water Development Board as part of “Texas Water Day at the Capitol” in Austin. The award recognizes those who have demonstrated an outstanding and innovative commitment to the state’s mission of promoting responsible management of water resources and the conservation of our water resources. 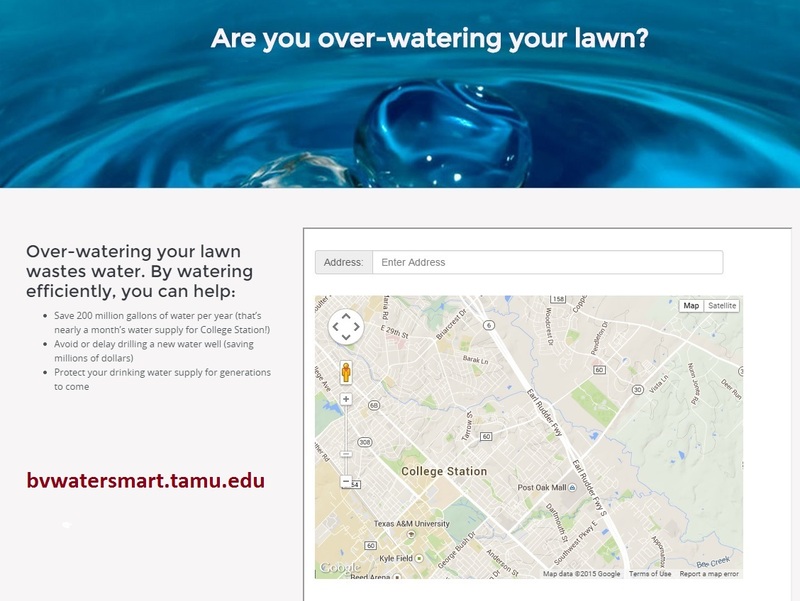 Brazos Valley WaterSmart is an educational and research partnership of Texas A&M University, the Brazos Valley Groundwater Conservation District, and the City of College Station. That means a lot of outstanding people are behind this tremendous success story. Faculty, staff and graduate students from the A&M’s Water Management and Hydrological Science degree program, Texas AgriLife Research, and the Texas Center for Applied Technology worked with staff from the city and district to develop the program. Agriculture and Life Sciences Professor Ronald Kaiser is the director. The research team found that about half of the water used in College Station and Bryan is for landscape, lawn, and outdoor purposes. They knew that helping the community find creative and innovative ways to be more efficient was the key to significant savings. The six programs they created include weather stations, a website, personalized weekly watering notifications, residential water budgets, free residential irrigation system inspections, water conservation seminars, and public service announcements. Each program focuses on a different aspect of outdoor water usage to educate residents on ways to conserve. To everyone involved — especially the environmental technicians who work on specifying, installing, and maintaining the weather stations and rain gauges that make up the weather-based watering recommendations — WAY TO GO! With July being Smart Irrigation Month, it’s an ideal time to improve the efficiency of your outdoor irrigation system. The City of College Station is here to help. If learning how to program your sprinkler controller, spot irrigation leaks, and cut your water bills rank high (or at least somewhere) among your summer goals, you’ll want to attend one of College Station Water Services’ free summer workshops. The first one is Saturday, followed by additional sessions on July 21 and Aug. 4. Each workshop is from 9:30 a.m.-noon at the College Station Utilities Meeting and Training Facility at 1603 Graham Rd. Each participating household receives a rain gauge, soil moisture meter, and $25 gift card to a home improvement store to start you on your way to saving water. Residents will learn valuable sprinkler system maintenance tips, see the latest in water-saving sprinkler technology, get pro tips from a licensed irrigator, and learn how to receive weekly watering advice from the Brazos Valley Water Smart Network. If you bring a friend, you’re eligible for a bonus prize! If you can answer “yes” to at least one of the following statements, make plans to attend one of the workshops. You water three or more times per week and are afraid that scaling back your schedule will damage your lawn. You have a small lot or water only a small backyard, but your summer water bill exceeds $30-40. You’ve had high summer bills in the past and want to avoid a repeat. You don’t receive weekly watering recommendations from Brazos Valley Water Smart. Your driveway or front sidewalk is wet after every irrigation cycle. You have dry spots in your yard despite regular watering and don’t know how to fix it. You don’t know how much water your system uses or how much your lawn needs. Your irrigation system doesn’t have a rain shut-off device — or you don’t know what one is! You see fogging or misting when your sprinkler system operates. For more information or to register, contact Water Resource Coordinator Jennifer Nations at 979-764-6223 or jnations@cstx.gov. If learning to program your sprinkler controller, spot irrigation leaks, and trim your water bills rank high among your summer goals, you’ll want to attend one of three free workshops hosted by College Station Water Services as part of Smart Irrigation Month. Each participating household will receive a rain gauge, soil moisture meter, and $25 gift card to a home improvement store to get you on the way to saving water. June 10 — 10 a.m.-noon, CSU Meeting & Training Facility (1603 Graham Rd.). June 17 — 10 a.m.-noon, Event Center at Castlegate II (4205 Norwich Dr.). July 22 — 10 a.m.-noon, CSU Meeting & Training Facility (1603 Graham Rd.). You have a small lot and have had a summer water bill greater than $30. You’ve had high summer water bills in the past and want to avoid sticker shock again. You’re curious about how slight adjustments to your watering schedule could save you money. You have a sprinkler system but are afraid that scaling back your watering schedule will kill your lawn. 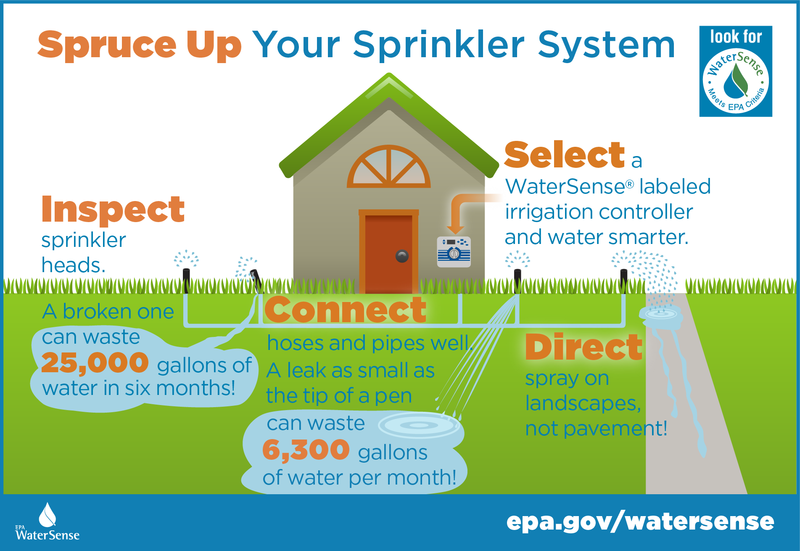 You don’t know how much water your sprinkler system uses or how much water your lawn needs. Your neighborhood or homeowner association collectively wants to reduce the amount of water consumption and runoff – and clear up those algae-ridden sidewalks! You’ll discover valuable sprinkler system maintenance tips, see the latest in water-saving sprinkler technology, get pro tips from a licensed irrigator, and learn how to receive weekly watering advice from the Brazos Valley Water Smart Network. For more information or to register, contact me at 979-764-6223 or jnations@cstx.gov. Have you ever wondered when you should water and for how long? Just how much water does your lawn really need, anyway? Not long ago, answers to those questions were just guesswork. Thanks to the innovative new Brazos Valley Water Smart website, those days are gone for good. Now you can receive free weekly email alerts to help you decide whether your lawn needs water that week or not – and that means a healthier lawn and a leaner water bill. Based on weather stations and rainfall data collected across Brazos County, the weekly recommendations are tailored specifically to your neighborhood, which helps you know when to water and when to turn your irrigation controller off.